The countdown has started. In 5 months the public will vote on whether it wants a penny sales tax increase that will go toward funding transportation projects in its district. In full disclosure, I am an avid proponent of public transit. I hate driving. I don’t know if it is Atlanta’s nightmarish traffic congestion or the fact that every road seems to have ten stop lights within a mile stretch that always seem to be turning red as I approach. I disclose my bias because I know this article will be slightly skewed in favor of the transportation referendum passing on July 31st. I will try to present information on the referendum in a neutral (well, maybe only slightly-biased) way. 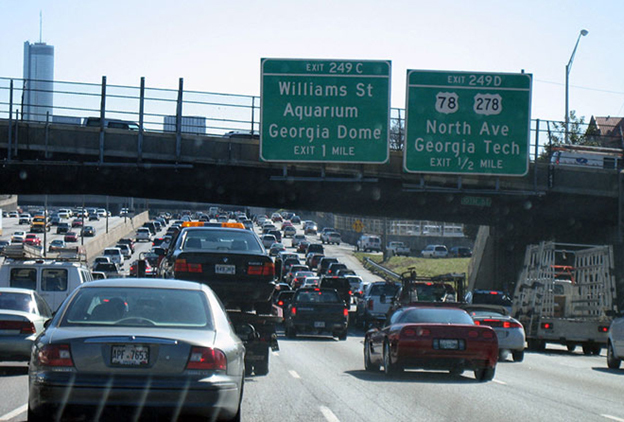 In 2010, the Georgia General Assembly approved the Transportation Investment Act of 2010. The Act can be found by visiting the Georgia General Assembly’s website. The Act allows designated districts within Georgia to impose a penny sales tax increase to fund transportation projects within the district. The Act divided the state into twelve transportation districts that essentially mirrored the State’s twelve regional commission boundaries. Per the Act, each region then had to create a Regional Transportation Roundtable composed of elected officials from the counties and cities within each district. The City of Atlanta and Fulton County are included in the Atlanta Roundtable Region. The Atlanta Roundtable Region includes Cherokee County, Cobb County, Douglas County, Fulton County, Fayette County, Clayton County, Henry County, Rockdale County, DeKalb County, and Gwinnett County. Before the Transportation Investment Act passed, many people voiced concerns about the types of projects the additional money would fund. For example, people in Atlanta worried that the additional tax revenue would go to counties in rural parts of the state to build new roads and bridges. Moreover, people outside of Atlanta worried that the all of the money would go to Atlanta and its pet projects. In my opinion, the General Assembly pacified many of these fears by requiring districts to list and publicize the specific projects that would receive transportation tax revenue and the amount that each project would receive. This way, the money is “earmarked” for certain projects instead of going to some blackhole general fund where it could be haphazardly apportioned to projects based on political leanings (not that the projects on the list were immune from politics). Further, the public was able to comment on the list of projects at town hall meetings held in each region. Counties and cities within each district submitted various transportation projects to the Roundtable for final approval. Each Regional Transportation Roundtable then had cut the list down so that project costs matched the anticipated revenue from the penny sales tax. Negotiations, concessions and compromises resulted in our current constrained list of projects submitted on October 13, 2011. As shown below, the list is almost equally split between road/bridge repair/construction and public transportation projects. Only the money raised within the transportation district goes to transportation projects approved by that district. The list of projects can be found here (note, the entire document is 192 pages!). On July 31, 2012, voters will go to the polls and vote “yes” or “no” to the transportation sales tax. If the referendum passes in a district, every county and municipality within the district must impose the tax-there are no exemptions. The penny sales tax passes if a simple majority of the voters in the district approves the tax increase. If the referendum passes in a district, the tax will be in place for ten years; after ten years, the district must again vote to renew the tax. No extension is permissible unless voters approve the extension. In the Atlanta Roundtable district, the revenue generated from the penny sales tax is projected to be around $7.2 billion. Of the $7.2 billion, 85% will go toward projects (in the specified amounts) on the list of projects approved by the Atlanta Regional Roundtable on October 13, 2011 and is projected to be approximately $6.14 billion. The other 15% of the funds go to counties and municipalities within the district to fund smaller local transportation projects like new sidewalks and bicycle lanes. Again, it should be noted that ALL revenue from the tax stays within the district that approved it. Why This Tax Is So Important-GO VOTE! The Atlanta region is rapidly expanding. Our population growth is unprecedented and continuing to grow. This growth inevitably means more automobiles on the roadways and more traffic congestion. Not only is our current infrastructure incapable of handling the increased growth, but our quality of life will start to (if it has not already) decrease because of worsening air quality, immobility, and disconnected neighborhoods and people. Accessibility in general will deteriorate. If the whole “environmental/socioeconomic” thing doesn’t float your boat, maybe pure economics will instead. The more traffic we have the more business we lose. It’s that simple. Businesses are concerned with their employees being able to reliably commute to work; if traffic gridlock slows employees down, the employees are less productive which means the business is less profitable. In a sector where productivity is king, businesses are not willing to lose time and productive output to nightmarish daily commutes. There are a thousand other reasons why this transportation referendum is vital for Georgia’s continuing vitality. With all of this in mind, PLEASE go vote on July 31, 2012 (even if you vote “no”-at least you have voiced your opinion!). For information on the success of the penny sales tax increase in other cities, please look at the Charlotte Lynx system below. Charlotte, NC implemented a half-cent sales tax increase to fund its transportation projects.